1. Preheat the oven to 200°C, gas mark 6. Bake the sausages on the bottom shelf of the oven for 30-40 minutes. Finely slice the onion. Dice the feta and tomatoes. 2. Deseed and dice the pepper, discarding the core. Arrange the tomatoes, pepper and onion in a shallow ovenproof dish. Mix the olive oil with the garlic and drizzle over the vegetables. 3. Scatter with the feta and plenty of black pepper. Bake on the top oven shelf for 15 minutes until hot. 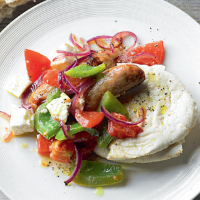 Serve with the sausages and pitta. Swap white pitta for wholemeal!